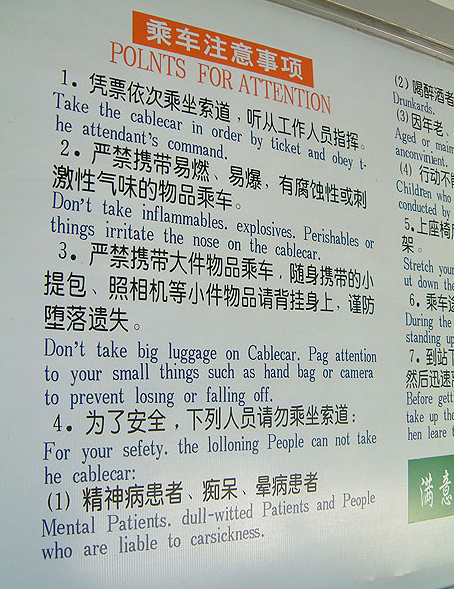 The safety instructions for riding a cable car in Gulin, China would amusing if they didn’t show how dreadfully backward and prejudice the richest communists in the world really are! Of course I can understand that people riding the cable car should be discouraged from taking explosives on board, and smelly things that can “irritate the nose” and if I knew what “lolling People” were, I would probably stop them from boarding too, but is it fair, reasonable or just to prohibit “mental Patients,” or even “dull-witted Patients” to be forced to spend hours trolling up a mountain instead of sailing up in a few minutes? I don’t think so do you? The prejudice of the Chinese doesn’t just apply to the unfortunate among us who suffer mental health problems apparently, according to Chinese authorities if you are “liable to carsickness” you must be mentally ill – see point 4.1! Which all goes to prove that not only should we not buy the shoddy goods manufactured in China which are made to the ‘break out of the box’ principle, we shouldn’t go to China on holiday either.